Disappointing. Bath house is new and clean but just one shower stall. WiFi did not work, no cable. Sites are new and clean with nice patio and picnic table. Sites are a bit close together. No one monitored over night fires, kids with golf carts, quiet time and the security Gates were open hours past 8. Staff drove Swan Bay trucks way too fast through park. No curbside trash pickup and overflowing dumpsters. Little offered for activities at the park . Had to go to Town. Area is awesome but for a pricey so called resort this place is nothing more than a new campground. There is an add on electricity charge too, so you pay dearly for the level pad and picnic table. Great stay, location, everything is terrific...make it a destination.. The ONLY REASON we stayed here is to get dependable internet. We asked about that amenity specifically when we booked. We did not get that AT ALL. In fact, from the moment we arrived, and heard OTHER PEOPLE voicing their concerns for NO INTERNET ACCESS- there was continuously NO RELIABLE INTERNET. The office tried to blame it on our equipment, and said WE just needed to reboot OUR COMPUTERS. NOT the case. Then they said it might be slow because of the amount of people in the park . They actually told us that "If the park really did have problems, then we'd have 100 people in here complaining!" NOT the case because we asked many other campers and NOBODY was getting internet..... many people told us that they were told by the office that THEY WERE THE ONLY ONES complaining! When the office finally acknowledged a problem, they blamed it on a storm that occurred a few days earlier. Finally after a couple of days and other people actually voicing their issues with the internet problems to the office.... the WIFI worked - for about one hour one morning, and then QUIT Again FOR THE REMAINDER OF OUR STAY. Ended up having to spend extended time numerous days at a coffee shop 15 minutes away from the park!! When we go to a $30 night park, we expect slow, mediocre WIFI- which is what we usually get in such a place. When you pay $100+ a night, there is simply no excuse for extended WIFI outages- throughout the day, even at 4am, (short of a serious storm taking out towers, which was NOT THE CASE) The worst of it was the BS that they insisted for the longest time that the PARK DID NOT HAVE ANY PROBLEMS, and that it was our equipment that was the issue. Again- spoke with MANY fellow campers, and NOT ONE was getting WIFI. The office did not offer anything at all for compensation either for these problems- so warning: if you are expecting WIFI at a campground, do NOT bother with this place. We stayed here for only one night during Memorial Day weekend. As expected the place was busy. But, staff very friendly, well maintained park, did not use pool but looked good. Convenient location to Ferry to Thousand Island and Boldt Castle. Only complaint was that the dog park, although a good size and had bags, was overgrown and you could not see if you were gonna step in some poo. Wonderful, wonderful, wonderful!! Spent labor day weekend at Swan Bay Resort. We were close to Alex Bay and the Blues Festival and tours for first day of our stay. Then went to Clayton and the surrounding State Parks the next day. Cannot beat the location. Our site stayed dry and comfortable while the area experienced heavy rains and storms. Definitely recommend this resort for enjoying your stay in the 1000 Island area especially if you have a big rig. Great spot near Alexandria Bay. Love that they have boat docks as well as RV spots. Spots are a little tight and very close. Waterside spots are gorgeous and big freighter ships pass right by very close. Inground pool with tiki bar and outdoor fireplaces with cozy adirondack chairs. Bathrooms and whole campground imacculate. They have gorgeous rental chalets for non RVing people. Bikes, kayaks, sea doos, pontoon boats for rent at the resort. If you can't find something fun to do here its your own fault! just down the road a few hundred feet is a gorgeous 1 mile track go-carts, mini golf, arcade and subway. About half an hour from Watertown and shopping mall. Very gorgeous resort, Staff helpful and friendly. Easy check in and out. No complaints at all. Will return and highly recommend, Sunsets over the bay on the nice patio swings are the best! We had a wonderful stay. The owner and caretaker were always there to help with questions about the area and the history of the campground. They always smiled. The campground is spacious and comfortable. The location is perfect. How could it not be on a Lake! Everyone was pleasant campers and staff alike. We will be back next year! 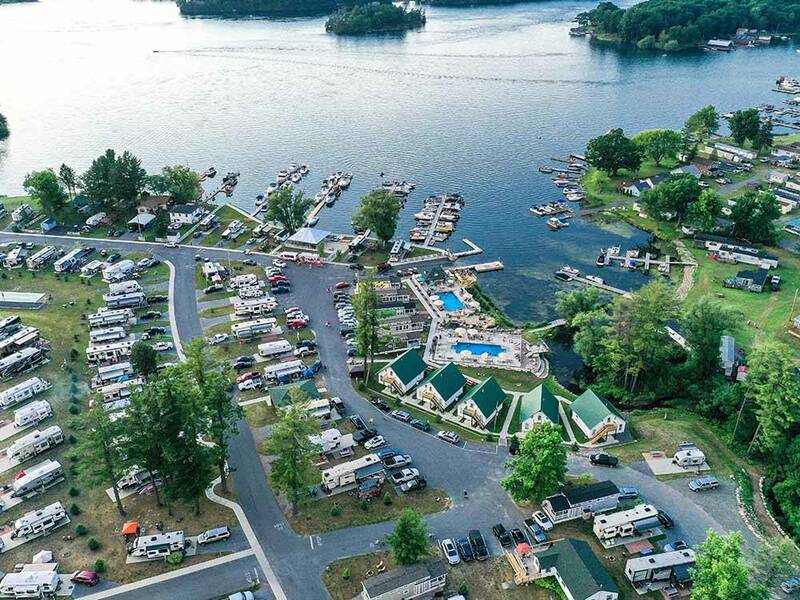 This RV park and Marina is beautiful. We had a wonderful view out the front window of our RV. Looking right our at the St. Lawerence seaway. The site is brand new, this would be their first full season of operation. all sites had concrete pad, water, sewer, electric hook ups. All sites have some view of the water. Great location and a top notch resort. The staff is very professional and make you feel like family. There is a lot to do in the area and there is a path to the food store next door (price chopper). I liked it so much that I booked a week in July 2016. We visited for the first time. Absolutely a great place! We are returning next year. Great restaurants nearby. Come & enjoy the 1000 Islands Waterways! We have our own marina, boat rentals, slip rentals and launch ramp. 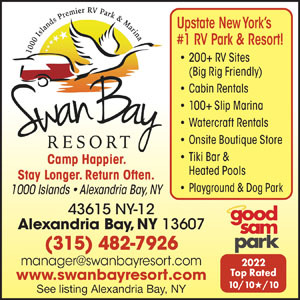 You can enjoy boating in the 1000 Island region while relaxing in our resort style campground. Relax at the pool and TiKi Bar after a day on the water.